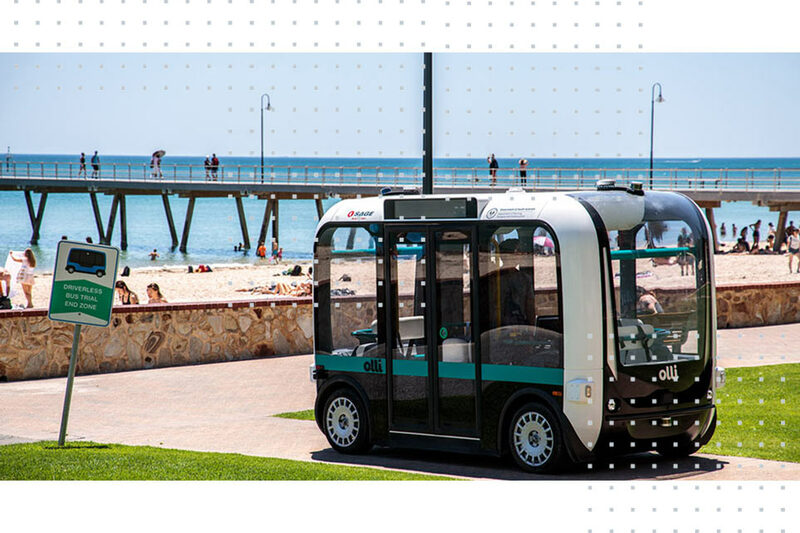 From January 2019 through to July 2019, SAGE Automation and Local Motors have partnered to bring an autonomous bus and smart transit hub trial to Glenelg, South Australia. The trial demonstrates first-mile last-mile transportation by allowing people to take the tram to Glenelg, then board Olli or vice versa. Experience the future of mobility in this world 's first fully connected trial. Matilda becomes the host when there is no human reassurance. From Matilda you can source the connecting tram timetable, book an Uber, locate the nearest bicycle hire station, or schedule a ride on an autonomous shuttle. 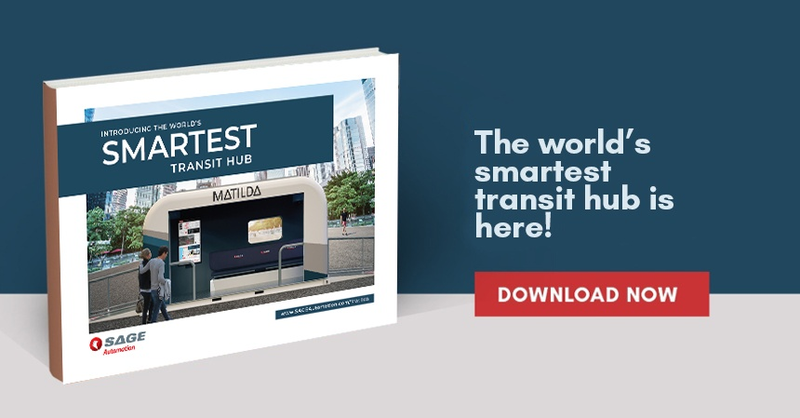 Because of this, Matilda is much more than a shelter that provides safety and comfort during your transit, she is your connection to smart mobility. Matilda is built to be relocatable within a few hours, runs on solar or battery power and is fully self-contained. Now, road authorities can trial different ‘first' or 'last mile’ locations, or put additional transport in place for major public events. Matilda connects people to the world of Smart transit and makes it fun! Today’s autonomous and connected vehicles need connected bus stops and transit hubs to deliver a SEAMLESS, tailored passenger experience. That’s why we made Matilda. Matilda is a portable, connected transit hub that is equipped with the latest smart technologies that offer everyone the equal opportunity of autonomous shuttle transportation. Matilda caters for passengers, based on their individual abilities, making each visit unique, easy and fun. Matilda communicates real-time with passengers, vehicles, fleet management servers, online and city transport systems. Matilda provides transport planners the passenger and traffic data they need to deliver efficient, personalised and safe services in the new world of driverless transport. Matilda can be easily moved and placed almost anywhere, including locations lacking utility connections. Her rigid structure and platform design accommodate easy transport by forklift or small truck. This gives transit planners greater flexibility when balancing geographic coverage or accommodating the changing needs of developing regions. Matilda offers the ability to power herself via rooftop solar panels so there is no need for utility connections. Her self-sustaining configuration lowers her operational cost and increases her flexibility of placement, all while positively contributing to the community’s sustainability. 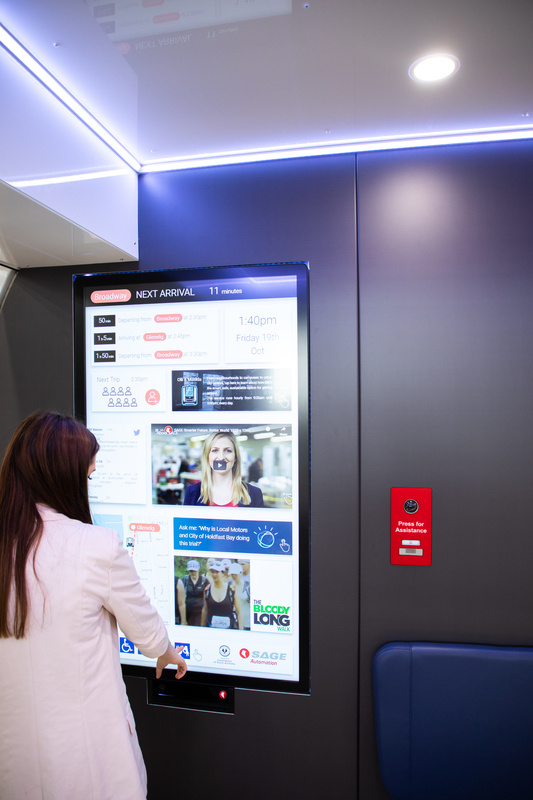 Matilda’s beautiful design and attention- grabbing technology provide the perfect setting for high visibility advertising and community engagement. media to subsidies costs through advertising, promote local business partners, survey rider experience for transport providers, and educate the community about smart city initiatives. Matilda’s features facilitate wheelchair users and those with physical, hearing, vision and cognitive impairments via the use of the latest smart technology. She is a great addition to retirement communities and hospitals. Transit providers can now invite more community members to enjoy independence and mobility freedom using public transport. Matilda uses her smart technology to provide care, comfort and safety to her guests. 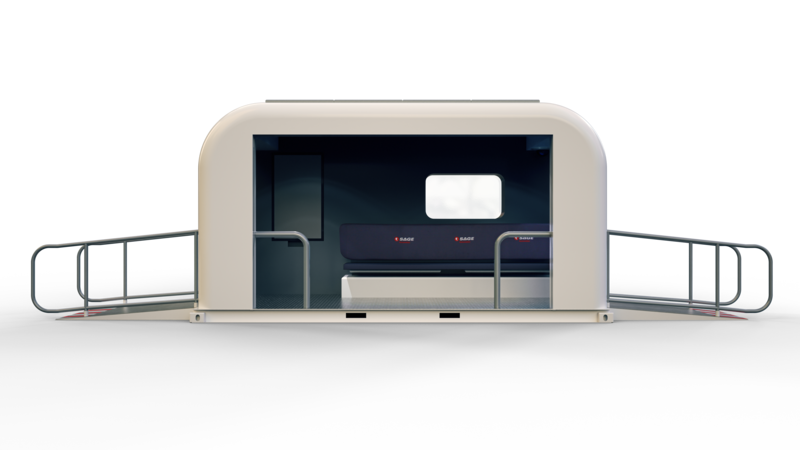 She is equipped with 24/7 surveillance cameras, handrails, slip resistant flooring, LED lighting and an emergency call button for rapid human assistance in the event of danger or distress. In the new world of Smart Mobility riders can travel with more assurance as transit providers use technology to ensure passenger comfort and safety. Matilda’s flexible ‘plug and play’ design can be configured according to your preference or budget. Let us know what features you need and we can source the technology or integrate your preferred technology partners. As governments and companies trial smart transport solutions like Matilda, they will need to monitor their performance. This is where the National Operations Centre (NOC) comes in. 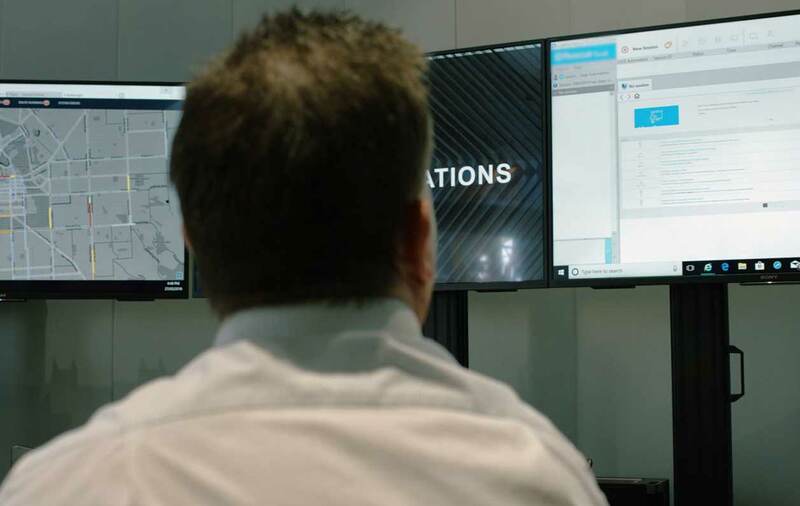 Located at SAGE Automation's national headquarters in South Australia, the NOC provides real-time monitoring of different assets to provide operational and maintenance support, emergency response, security monitoring, and assistance in managing incident resolution. We are using the NOC to monitor Matilda, and other trials, to determine their success and improve future offerings. How long is the trial running for? 6 months. From November 2018 through to May 2019. *We are currently in commissioning stage and not open for public rides. Please check our social media for the launch announcement. Many people don’t have the ability to get to public transport with ease. Olli and Matilda are equipped with technologies to get everyone from their homes to existing transport, and back again - also known as First Mile-Last Mile transport. Although the trial route is short, it demonstrates how First Mile-Last Mile works. The trial allows people to take the tram to Glenelg, then board Olli or vice versa. Along with these smart technologies and your participation we're working towards a future of smart mobility. Where is the trail route? The trial will running along Glenelg’s Southern Esplanade between the Stamford Grand Adelaide and the Broadway Kiosk. This is approximately 900m. Who is behind the trial? Local Motors is the creator of Olli and SAGE Automation is the creator of Matilda. Together with the Government of South Australia’s Department of Planning, Transport and Infrastructure we have the ability to bring the future of mobility to Glenelg. The City of Holdfast Bay will be returned to normal. Feedback from the trial will be assessed and technologies will continually improve to pave the way towards the future of smart mobility. When will Olli be taking rides? How can I book a ride on Olli? You can either book online at matilda.gotoSAGE.com or via the interactive screen in Matilda. It’s FREE! You’ll be asked to take a short survey pre and post ride which will help us collect feedback and give you the opportunity to have your say. How many people can ride on Olli at one time? Eight people, plus two onboard stewards to ensure everything runs smoothly. Can I book a return ride? Yes. To book a return ride, you will have to book each way as a separate booking. Can children ride on Olli? Of course! Children under the age of 2 may ride on an adult’s lap. If they are over the age of 2, they must have their own seat booked and be accompanied by an adult. How fast will Olli travel? Olli will travel at approximately 5-7km/h depending on the traffic. With 360 degree sensors, Olli will safely stop for anything and anyone in the way and ensure it is safe before proceeding on the route. If human support is needed, what happens? Matilda is equipped with 24/7 surveillance cameras, as well as a help point connected to a remote operations center. Simply push the help button in Matilda for assistance, or alert Olli’s onboard stewards. How long will the full route take? From end to end, the ride will take approximately 10 minutes depending on the traffic. Matilda is built to be relocatable within a few hours, runs on solar or battery power and is fully self-contained. Have more questions or want to provide feedback?